Musicians have special concerns when dealing with their health. There are certain musicians' products that are vital for optimal performance. I never leave home without these special musicians' products. Why? You see, as a trumpet and saxophone player/teacher, I am always worried about getting chapped lips. Ever since I was 9, I would always carry lip balm in my pocket. After all these years, I have gotten so quick at applying it, I can easily do it one-handed so I could quickly get back to playing my trumpet or saxophone. The problem was that not every lip balm worked out for me. The consistency wasn't good, or it had toxic ingredients (like parabens, petrolatum or petroleum or chemical dyes). When I learned about Lip Eze, and tried it out, I was ecstatic. The consistency was perfect (not "cakey" or greasy), I could play my instruments with it on, and the ingredients were all organic and I knew what they were (they weren't strange unidentifiable chemicals). 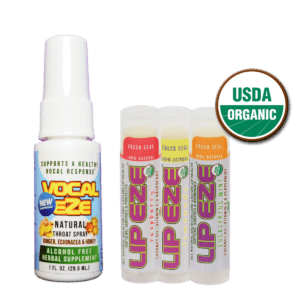 I wanted to make sure that everyone knew about Lip Eze, and had the same benefits as I did using it. There’s nothing more frustrating than trying to perform and you can’t stop your reed from squeaking no matter how much you soak it. If you live in a dry area, or even a high-altitude location, you may find that your clarinet or saxophone reeds squeak most of the time. This can be due to them being unbalanced. We also talked at length about how some of the great professionals are using the ATG System in all kinds of playing conditions, with great success. Folks like Eddie Daniels, Ricardo Morales (NY Philharmonic), and many others use the ATG System and depend upon it for solid performances day in and out. In my latest radio show for the BAM Radio Network, I had the great privilege of speaking at length with Tom Ridenour. Tom is a world-class Clarinetist, Educator and inventor who has created a product that can truly help clarinet and saxophone musicians of all abilities perform better and more consistently. I heard about Tom and his ATG Clarinet and Saxophone Reed Finishing System from a couple of friends who raved about how they were able to play every reed in the box. Their claim goes against the accepted belief that not every reed in the box will be playable. I had to see for myself, so I bought the ATG Clarinet and Saxophone Reed Finishing System. I couldn't believe my eyes and my ears! It really does work. To read more, and to get a limited-time 15% discount on the ATG Reed Finishing System, click here. Many musicians, in particular woodwind players, do not warm up properly before they start practicing or performing. Since irreparable damage can't necessarily be done by not warming up on a woodwind instrument (as opposed to a brass instrument), some folks don't recognize how a good warm up can enhance your playing. According to Nick, a good warm up connects your mind with your body: the mental with the physical states. When warming up, we are not just mindlessly playing long tones or running scales, we are thinking about how we are producing our tone, how we are coordinating our fingers, articulation and breathing. A good warm up keeps everything working the way you want it to. If you don't warm up, you're not paying attention to your physiology, and you're not even coming close to what you can get out of the instrument if you physically prepare your body. Playing the saxophone is physically demanding, and you need to prepare yourself for that. The main function of a warmup is to get your mind and body connected so you can make music efficiently. Want your Woodwind Reeds to last? Reedjuvinate them! 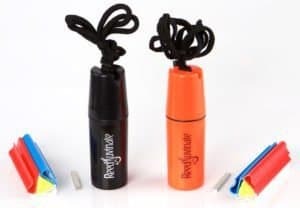 Reedjuvinate is a reed storage system that is cleverly designed to allow your woodwind reeds to last a long time AND prevent them from being infested with germs and mold. John Mackey is a MD and biomedical researcher, a passionate jazz musician, and lead alto sax player in the River City Big Band in Edmonton, Alberta, Canada. He was getting tired of spending so much money on reeds. Synthetic reeds didn't work as well for him. He got frustrated enough to do research to find a solution that would make reeds last longer. He created Reedjuvinate around 3 years ago to help Saxophone and Clarinet players have "Plug and Play," instantly-playable reeds. These reeds would last longer because they weren't subjected to the taxing wet-dry cycle that physically breaks down cane reeds. When he was first designing and researching to create the product, he used pure, re-agent grade ethanol. It helped keep the reeds hydrated and germ-free. But John wanted a way for kids to use the product safely, so he did more research and found that Original Listerine did the job just as well due to its own 30% ethanol content. I recently had the honor and pleasure of chatting with Tim Price, world-renowned saxophonist, about how to teach authentic jazz language. I had been reading Tim's article's on the Saxophone Journal for many years now, and had gotten to know him over the last 2 years while we met up at NAMM in Anaheim. Part 1 - we talk about how to start beginner Jazz improvisers, in a private and school setting, and strategies to keep the jazz language authentic. Part 2 - (coming soon) - we talk about helping beginner and intermediate saxophone players with tone quality and technique (and other topics). In the last few years, Rico artist Tim Price has had the extreme good fortune to have bands of his own featuring world class stellar players like Lew Tabackin, Bennie Green,Carl Allen, Ray Drummond, Allison Miller and Bill Goodwin. Tim's travels have also taken him to New Orleans in September 2004 for a very special "Coltrane Tribute" with Tony Dagradi, and superstar drummer Stanton Moore from the jam band "Galactic". The Coltrane event as well as the club "Snug Harbor" was SRO !! As were gigs that Tim played in the East Coast area with his bands with Rachel Z and drummer Bill Goodwin. At this point in time Tim's career couldn't be more positive, things are moving in a very positive way. Tim Price is a proud Rico artist, performer and educator worldwide. A Berklee College of Music graduate and one of the country's foremost woodwind artists. His stature at the North Sea Jazz Festival couldn' t have been more prestigous with a backup band of Bennie Green on piano, Ray Drummond on bass, and Carl Allen on drums. Tim's special guest that night at the end of his set was Dutch superstar tenor titan Hans Dulfer.Tim also has been a special guest with Grateful Dead member Bob Weir's RATDOG. Tim has played with musicians like Bennie Green, Hans Dulfer, Lew Tabackin, Ray Drummond, Jon Mayer, Greg Bandy, James Gadson, Don Patterson, Billy James, Major Holley, Alan Dawson, Bill Doggett, Jack Mc Duff, Cecil Payne, Richie Cole, Charlie Watts from the Rolling Stones, Gary Burton, Doc Severinson, Dr. John, Lew Tabackin, Charlie Mariano, Shirly Scott, Trudy Pitts, Bootsie Barnes, Sonny Stitt, Ernie Krivda, Rachel Z, Larry Young,George Young, Sweet Sue Terry, Greg Piccolo & Super Heavy Juice and Claire Daly. He's spent years in the trenches with the big bands of Tommy Dorsey under both Murray McEachern and later Buddy Morrow, Cab Calloway and Harry James. He's also been part of Ernie Krivda's Fat Tuesday big band. Tim's bassoon has been a part of the Lawrence "Butch" Morris Orchestra at the 2004 "Vision Festival" in New York City. He loved the soul and rock gigs he's played with Aretha Franklin, Billy Paul, The 5th Dimension, Lou Christie, Lloyd Price, Four Tops,Ike Turner, Lynyrd Skynyrd and many others from that idiom. Some people might find this facet interesting considering that when Tim left Berklee he went on the road playing the jazz organ bar circuit. Tim has played with every major organ player except Jimmy Smith. Tim feels that was a great proving ground for a young saxophone player and something that is really missing today- Those classic jazz bars in major cities and small industrial cities scattered through the United States. Playing jazz 6 nights a week in a environ that is a proving ground for your growth. Mr. Price's writing on jazz and the saxophone appears regularly in the Saxophone Journal, he has been a featured writer for that publication for over 18 years. In addition to being the recipient of a Pennsylvania Council on the arts fellowship jazz grant five times!! His saxophone books are published through Hal Leonard. He currently writes workshop-ma ster class articles for SONIC , the innovative German / Dutch music magazine. He has authored three books on sax playing, and his blogs for Rico Reeds on Facebook and Myspace appear every Monday. His original tunes have been recorded by Houston Person,Supersax tenor player Jay Migliori and his composition " Twins Of Spirit" has been recorded by the Sean Kennedy 5 featuring Bob Mintzer. Tim played the NORTH SEA JAZZ FESTIVAL in Holland in July 2002, as well as many radio shows and clubs with Dutch tenor sax player Hans Dulfer. Other festivals include Newport Festivals,Vision Festival in NYC, Tri-C Jazz Festival, Berks Jazz Festival ,Cape May Jazz Festival & Boston Globe Jazz Festival. One of the Rico's most requested clinicians, Mr. Price travels worldwide performing with and teaching student and professional jazz ensembles. You can contact Tim at timpricejazz@aol.com. Tim studied Jazz BA (Before Aebersold!). The way he learned was via Call and Response, which is what he suggests for teachers. What makes kids want to practice their instrument? Some kids want to play a really cool song they heard on the radio. Some kids need an outlet to express themselves. Some want to be hanging out with their friends, who also take instruments. Others may have found something they can relate to and identify with, and may want to become musicians when they get older. For these young musicians, getting them to practice on a regular basis is easy because they are self-motivated. But for the majority of parents and music teachers, getting kids to practice is like pulling teeth - it's a painful, daily fight. Many parents and teachers use incentives like stickers, candy, and music books to "persuade" kids to practice, in the hopes that once a child starts to see (and hear) progress, they will be more self-motivated to practice. Parents can relate this to trying to get their kids to eat vegetables. They try to hide the vegetables in some kind of creative concoction so their kids will get the valuable nutrients in the vegetables and also start to realize that vegetables can taste good too. Lots of times, incentives work. If used right, after a while, kids don't need the prizes to lure them into the practice room because they have established a set routine of practicing and are getting results. The teacher has hopefully established a strong foundation of how and what to practice so the beginning musician can work on their goals in a structured fashion. Sometimes incentives don't work - the young musician may not understand a key concept about producing sound, which makes them embarrassed to play in class and afraid to ask the teacher for help. They eventually drop out because they feel it's too hard to play an instrument. Ian is a musician, teacher, father and entrepreneur who graduated from Queen's University and the Royal Conservatory of Music at Toronto. He is a Registered Music teacher, and has a thriving studio at www.musicbyiangreen.com. MyMuCo Inc. is a technology start-up based near Toronto, Canada, with a mission to strengthen the global community of musicians, to nurture new musical talent and to provide more resources to musicians with which they may pursue their passions. Ian has been working with the Pridmore family for a while now and has noticed tremendous progress with Elyse once she started using the MyMuCo app. In fact, the makers of the app did some research and have found that students using the app have made over 30% more progress than those not using MyMuCo. What's happening here? Is this the answer to motivating students to practice? For Elyse, it certainly is. In my latest interview, found here, Elyse tells us in her own words what motivates her to practice. She also gives teachers some tips to help their students. How can the MyMuCo app help teachers and parents? To read more, and to get access to a very special limited time offer, click here..
Marketing; Do Music Teachers Really Need It? Being a music educator and a performing musician, I am alarmed at the constant news of music programs being cut, music teachers being laid off and students not getting the best music education available. The pressure for school districts to "make the grade" on Common Core tests has directly affected music and arts programs not only for current students, but for this generation. The truth is that you already are a salesperson! ??? Yes! Every time you step on that podium, or bring your performing group to a community event or competition, you are promoting, or selling, your program. This is especially true with your community events. There could be an important political or public figure in the audience that can become a great future supporter of your program. By running a great program, you are already marketing and selling music education to your community. But, there are more strategies you can pursue that can have a huge impact for you and your program. This is where Kathleen Heuer comes in.